Fall and winter really is a magical time to visit the major attractions in Orlando. Disney, Universal and other parks offer special events to celebrate Halloween, Christmas and other winter events, offering a highly memorable experience for the whole family. If you are planning an Orlando vacation during this time of year, don’t miss out on these incredibly festive celebrations that will get the whole family smiling. Theme parks in Orlando can be just as fun during the fall and winter months as they are during the summer, except that you’ll likely experience smaller crowds and cooler, more enjoyable weather. Planning Orlando vacations during the fall and winter months is a great way to surprise your loved ones. By planning ahead and taking advantage of some of the amazing off-season deals, you can give your family the trip of a lifetime while saving money as well. When planning a trip to Orlando during the fall and winter, it’s important to remember that there will still be crowds to deal with, as the weather is incredibly mild and still warm when compared to other parts of the country. 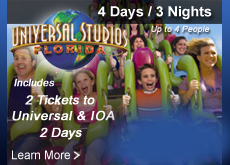 Orlando Discount Tickets USA has this suggestions for you enjoy the most in tour trip. * Keep in mind that other families are trying to save money on vacations as well, so plan on visiting the major theme parks early in the day and during the weekdays if possible to avoid the crowds. If you are interested in going to a special holiday show, be sure to double-check the times and dates and buy tickets in advance if you can. This is a great way to save money and also ensures that your family will have a spot reserved for the shows that you want to see the most. * When packing for a fall or winter trip to Orlando, it’s important to pack appropriately. While the temperatures are typically pretty mild all year long, there are still risks for hurricanes and heavy rains during this time of year. Be prepared by packing along a lightweight raincoat and comfortable shoes that are good for exploring the attractions. By thinking ahead and planning accordingly, you can be prepared to show your family the trip of a lifetime. Independiente de la epoca del ano que su familia viaje Orlando Discount Tickets USA cuenta con mas de 400 paquetes vacacionales que incluyen acomodación de hoteles, Resorts, Villas y casas vacacionales e ingresos a los parques Temáticos de Disney, Universal Studios y Seaworld. * Radisson Orlando Celebration: Orlando Discount Tickets USA ofrece por solo $429 hotel con habitación standard en la cual duermen hasta 4 personas y 2 admisisones para 2 adultos cada uno con acceso a 2 parques Tematicos Disney y Universal Studios. * Vacation Villas at Parkway: Orlando Discount Tickets USA por solo $459 proporciona acomodacion en una villa de 1 habitacion totalmente equipada en la cual duermen hasta 4 personas 2 admisisones para 2 adultos cada uno con acceso a 2 Parques Tematicos Disney y Universal Studios. Este paquete por solo $75 dolares mas extiende acomodacion en una villa de 2 habitaciones. 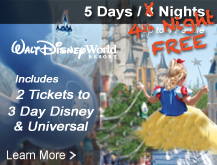 Visite www.orlandodisocuontticketsusa.com to plan yournext vacation package to orlando Disocunt Tickets USA.